The potato (Solanum tuberosum) is a member of the nightshade family and a relative of the tomato. The potato is native to South America and was originally cultivated by Andean farmers over 8,000 years ago. Today, potatoes remain an important food crop globally. Thankfully, potatoes are easy to grow. If you are fortunate enough to be a gardener with a greenhouse, you can grow your potatoes all year long. Place the potato seeds in a warm, well-lit spot. Allow them to remain until they have begun to sprout. Prepare the planting bed or the planting pots, depending upon which method you will use in your greenhouse. Mix equal parts of damp potting soil and compost and pour it into the planting pots, until they are 3/4 of the way full. If you will be planting in a bed, mix a 2 to 3 inch layer of compost into the soil and rake the area level. Press the seed potatoes 1-inch into the soil, sprouts facing up. Cover them with soil and water until the soil is slightly moistened. Check the temperature of the greenhouse every morning. It should remain between 50 and 60 degrees Fahrenheit. Water the potato plants in the evening so that the soil remains moist. Generally, you will need to water the potato plants every two to three days. 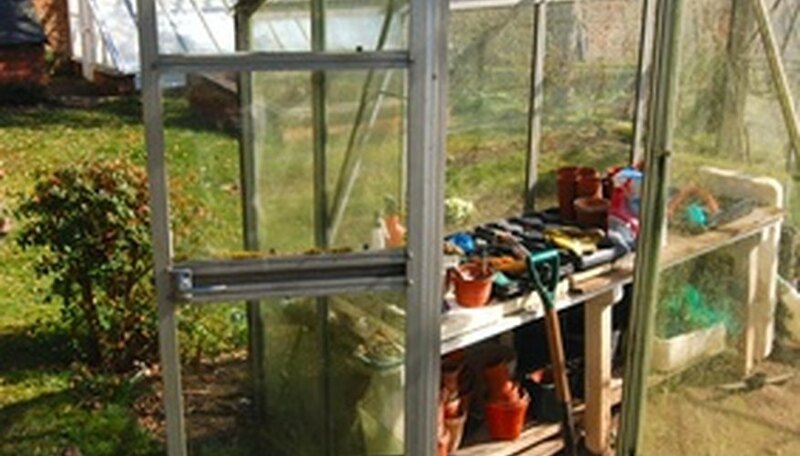 Close all the greenhouse windows if the temperatures are expected to drop in the evening. Cover the potato plants with more soil as they begin to emerge from the soil. Do this two more times during the growing season. Each time the greenery shows above the soil, cover it with more soil. Discontinue watering the plants when the leaves begin to yellow. Harvest your potatoes three weeks after for baby potatoes and six weeks after for larger potatoes.